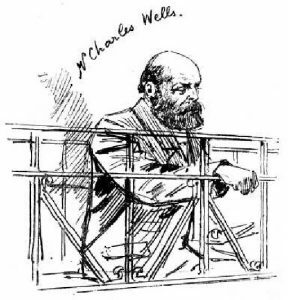 When Charles Deville Wells was arrested for fraud in 1893 he appeared before Sir John Bridge, the chief magistrate for London, at Bow Street Magistrates Court. The object of the hearing was to assess whether there was enough evidence of wrong-doing for Wells to face a trial at the Central Criminal Court – the Old Bailey, as it is popularly known. Over a period of several days, a succession of prosecution witnesses gave their side of the story. 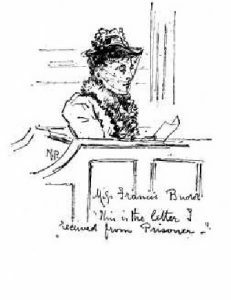 The last witness of all to appear was a Miss Frances Budd who claimed to have answered a newspaper advertisement placed by Wells, offering to sell a quarter share in one of his inventions for £30 (roughly equivalent to £3,000 today). Miss Budd did not have that much money to hand, and had asked Wells if she could invest just £15. Wells replied that this was not possible and so she finally scraped together the full £30. She had never received any return on her investment, she testified, despite threatening to sue Wells. Friends had advised her not to throw good money after bad, and so she had not pursued the claim. An extraordinary revelation now followed. She went on to state that she had subsequently visited Monte Carlo, and had actually seen Charles Wells at the casino. ‘What was he doing?’ Sir John Bridge enquired. ‘Did you follow his luck and get your £30 back?’ Abinger [the defence lawyer] asked. Immediately after hearing Miss Budd’s evidence, the Magistrate concluded that there was evidence of false pretences in all of the cases, and committed Wells to a criminal trial. For the prosecution and the police, Miss Budd must have been quite a find. Not only was she allegedly one of Wells’ victims — a woman of fairly modest means who would have been viewed with sympathy by a jury; she had also observed him gambling at Monte Carlo with what were presumably the proceeds of fraud. It all seemed too good to be true. And before long Miss Budd’s story had me wondering whether or not it was true. While researching the book, I cross-referenced every individual mentioned by looking them up in the various censuses, birth, marriage, death and other records. It was usually an easy matter to find people in the 1891 census, which had taken place only two years before this hearing. But Miss Budd was an exception. She claimed to have lived at Worthing in 1889, when she first contacted Wells. Subsequently she had moved to Woolton, Liverpool. But no trace of her can be found in either place in the census. In fact, at this stage I saw no plausible match for her in any of the usual sources. My suspicions were aroused. Could the police have persuaded someone to testify against Wells to strengthen their case against him? Was there any significance in the fact that she was the very last witness at this preliminary hearing? Was she the card they kept up their sleeve in case the other testimony against Wells was not convincing enough? 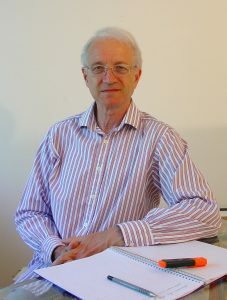 Wells’ activities as a con-man had been public knowledge for years, but until now the police had hesitated to arrest him because of the difficulty in proving fraud. Perhaps, even at this late stage, they still felt the need for a ‘star witness’ to bolster their argument. Of course, if Wells had been certain that no-one of that name had ever been in touch with him, he could have raised an objection in court. But it is recorded elsewhere that he had so many “clients” that he could not remember them all; and, in any case, an investment of £30 was too small to have been memorable, other people having handed over as much as £18,000. The record states that he and Miss Budd had never met, and thus he had little reason to recall whether or not she had been his client a few years previously. But there was some evidence to suggest that she was a real person, even if she was an elusive one. A minor point I had noted during my research was that Budd is a name often encountered in West Sussex, including the general area of Worthing. If she were an impostor, would the police really have gone to all the trouble of finding a name suited to the place where she is supposed to have lived? Would they even have considered it? And would they have had access to such information in that era? Furthermore, a claim for the return of her £30 was later submitted in her name during the process of Wells’ bankruptcy. If she had been a mere puppet controlled by the police, would such a claim really have appeared? Considering all the paperwork and additional scrutiny that would have been involved, and the risk of the trick being discovered, I think it is unlikely. So I decided to intensify my hunt for the mysterious Miss Budd. Wells’ bankruptcy records show her name as ‘F. 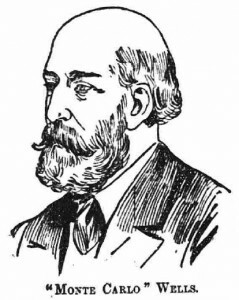 M. Francis Budd’. Leaving aside the question of whether to spell Frances with an ‘e’ or an ‘i’, I concluded that her correct name was probably Frances M. Budd. This led me to an 1865 birth record in Bangalore, India, for a Frances Maud Budd, the daughter of a military officer. If so, she would have been about 27 at the time of Wells’ trial. Although the magazine illustration tends to suggest an older woman, it is probably our modern preconceptions that lead us to believe this. A 27-year-old woman making an appearance in court today would dress in a somewhat ‘young’ or contemporary fashion in spite of the formality of the occasion: while a more mature person might favour more sober or traditional clothing. But in Victorian times, there were no such divisions. Everyone dressed alike. The individual portrayed in the sketch could be young, middle-aged or elderly. On balance, I conclude that Miss Budd genuinely was one of the victims of Wells’ fraudulent scheme. I am not so sure, though, about her tale of having watched him ‘break the bank’ at Monte Carlo. Since she was allegedly so hard up that she could only afford to invest £15, and was only able to come up with the full amount after some difficulty, it does seem doubtful that, soon afterwards, she was able to take a trip to Monte Carlo and visit the casino. Whatever the true facts, it is certain that her evidence helped to commit Wells to a full criminal trial. 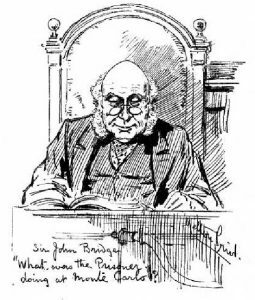 When, as a consequence, he appeared at the Old Bailey, a string of prosecution witnesses – many of whom had testified at the preliminary hearing – gave evidence against Wells. Curiously, Miss Budd was not among them – a fact which was never explained, or even mentioned, at the time. We may never know the full story of the mystery witness. Or perhaps it’s just that “the jury’s still out”. (As a final thought – as far as this story is concerned – a Frances Maud Budd died at Bournemouth in 1952 at the age of 86. This means that ripples of this story extend well into the last century; in fact, if this Miss Budd was who I think she was, it would mean that at least one of Wells’ victims was still alive when I was still a small child). [*The dialogue from Bow Street Magistrates Court, quoted above, is from my book, The Man who broke the Bank at Monte Carlo, page 123]. 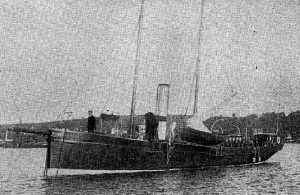 A yacht belonging to Charles Wells, the man who broke the bank, pictured in 1912 at Falmouth. After committing bank fraud on a huge scale in Paris, in 1910-11, Charles Deville Wells (the man who broke the bank) escaped to England and lived on a yacht in Falmouth harbour. Moorings were provided by a local shipbuilding company, Cox & Co., who even received Wells’ mail on his behalf, and who almost certainly carried out work to the yacht, which Wells was always improving. When Wells was finally arrested on the vessel, in early 1912, he was charged in the presence of a Justice of the Peace, Arthur William Chard. 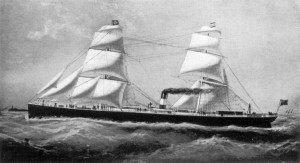 Chard also had connections with marine engineering, and I mention in the book that he and the owner of Cox & Co. were evidently acquainted: ‘… on at least one occasion the two men had jointly presided over the committee which investigated wrecked and missing ships.’ I make the point that Wells was also passionate about ships and the sea, and – in other circumstances – the three men would probably have got along famously together. An additional piece of information has come to light. Yesterday I found this on the simplonpc.co.uk website. It concerns the River Fal Steamship Company and shows that there was a further connection between Chard and Cox , which I hadn’t previously been aware of. 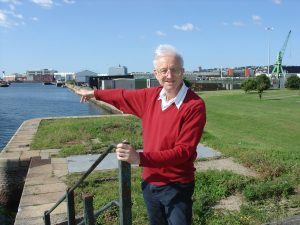 My thanks to Ian Boyle who runs the site, simplonpc.co.uk , which contains some very interesting material and is well worth a look! The Man who Broke the Bank at Monte Carlo – Charles Deville Wells, gambler and fraudster extraordinaire is quite a long title! An early portrayal of Charles Wells of Monte Carlo fame? While researching Charles Wells, The Man who Broke the Bank at Monte Carlo, I had difficulty finding any early pictures of him. This came as no surprise. In the 19th century relatively few individuals ever had their portrait drawn or painted; and photography was an expensive and arcane art, usually reserved for important people and special occasions. But I did eventually stumble on the image shown on the left. For comparison, the sketch on the right, taken from a contemporary newspaper, portrays “Monte Carlo Wells” not long after he broke the bank in 1891. Although the two faces are not dissimilar, I wondered why – and when – Wells of Monte Carlo would have had his portrait painted as a young man. He had been an engineer at Marseille, and his salary would not have been spectacularly high. But it has been established that in about 1868 he had invented a speed regulator for steam engines, and he reputedly sold the patent for about five times his annual salary. Could he have celebrated his good fortune by sitting for a portrait? It seemed an intriguing possibility. To resolve the question, I needed to look no further than Wikipedia! 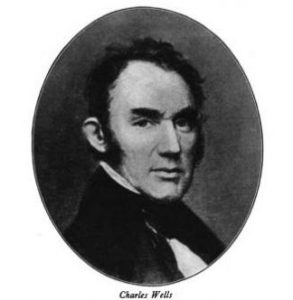 The entry on “Charles Wells (American politician)” includes this same image and reveals that this was another Charles Wells, who lived from 1786 to 1866, and was the fourth mayor of Boston, Massachusetts. Clearly he was nothing to do with Wells of Monte Carlo, who was born in 1841 and lived into his eighties. To make sure, I consulted a 1914 publication with the extraordinary title: Mayors of Boston: An Illustrated Epitome of who the Mayors have been and what they have done. The same portrait appears on the page dedicated to this individual, followed by a brief biography. It seems that this Charles Wells served as mayor from 1832-3. He was a master builder by trade, and ‘little fitted for public office … a man of simple character, not much versed in public affairs’. The irony is that, if it were not for the fact that many people now confuse him with “Monte Carlo Wells”, Charles Wells of Boston would almost certainly have faded into obscurity, since his career seems to have been singularly undistinguished. And if there’s a moral in the story, it’s that the repeated appearance of an assertion, whether in print or on the internet, does not necessarily validate that “fact”!